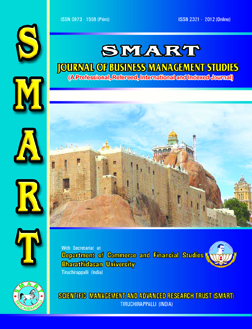 SMART Journal of Business Management Studies is published by the Scientific Management and Advanced Research Trust (SMART). The First Issue (Volume-1, Number-1) was released by Professor. C.Thangamuthu, Vice Chancellor, Bharathidasan University, India on 07.01.2005 during a function organized for this purpose. It is a unique research Journal of contemporary business management studies. It is a PROFESSIONAL, REFEREED INTERNATIONAL AND INDEXED JOURNAL devoted to the analysis and portrayal of development in business management, banking and information technology. SMART Journal publishes only research articles which are subjected to BLIND REVIEW. Our mission is to examine diverse aspects of rapid changes taking place in the aforesaid areas. The Journal plans to stimulate and develop future debate on areas of topical concern. The Journal contains articles/ scholarly features covering a wide spectrum and encompassing a broad canvas of business management issues. It will lend a new perspective to throw light on hitherto unexplored areas of the subjects and convert them into subjects for critical study. It will also articulate rigorous scientific discussion on the diverse concerns of research in the above mentioned areas. It will also serve as a forum to share fresh thinking and to debate matters of national and regional concerns for the benefits of international community. It will provide a forum for the multi disciplinary and inter disciplinary study of contemporary business management issues of interest to India as well as to the international community. The policy of the journal is to publish papers, articles, reviews, case studies etc., which provide an objective analysis based on scientific concepts, empirical research and factual data and operational facts of business management, banking and informational technology. The journal thus intends to improve communication between communities and practitioners of corporate bodies, financial institutions, banks, etc., who are responsible for operational and policy decisions. It is a Biannual Journal published in January and July every year. The Journal will be useful to bankers, industrialists, professionals, teachers, researchers and students. The Journal has no particularistic affiliation or orientation and is designed exclusively to serve the entire mankind with special reference to the issues of global business management. © 2015 Scientific Management and Advanced Research Trust (SMART) All Rights Reserved.